My roommates decided to meet once again to refresh our friendship. And here is a snap of Aisha with the kids of her Ma's friends. 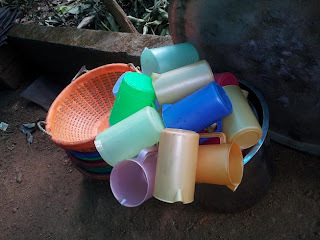 My elder SIL was in pregnant and not feeling well after we returned from the marriage. So they went to the hospital the next day, and she was in labor. But since her earlier deliveries were by C-sections, the doctors immediately proceeded with the surgery. We had another little girl in our family - I was happy. My brother's kids, my niece and nephew, were staying with us and everyone of us was happy - we planned to visit the hospital the next day to see the mom and the newborn. I heard the phone ring at 6:00 am on Christmas morning, and I thought it was from the hospital calling us remind something. My father attended the call and the he called me to say that the baby has passed away. I couldn't believe! But then my brother explained to me that there was a problem of class 2 Placental abruption and the baby was in critical condition. I didn't know how to reveal the news to my niece and nephew. During breakfast time, my Aunty explained the situation to my 6 year old nephew - who bore the news more strongly than I thought. His explanation was simple, "I have to look after my sister, Aisha and my younger cousin brother. So it is good that the baby is gone." By 10:00 am, my brother and mother brought the baby home - she was a beautiful little angel! I'll never forget the small face behind the white clothes. Here comes a mate for my son in heaven, Hamdu mon. I can still here the shouts of my 3 year old niece, "Don't take my baby to the graveyard!" Allah loves us a lot. I'm sure that is the reason why he took two of our kids - mine and now my brother's. And I'm happy to know that they are enjoying their life in heaven while waiting for their families. But I'll miss them a lot. A lot. Christmas time means wedding time. With the long vacation and the cooler climate, people tend to put their weddings during this time of the year. We had some four marriages, but due to Aisha's fever, I was only able to attend three of them. The first wedding was my cousin sister's. We went to the bride's home on the eve of the wedding, and Aisha and myself spent the night there. I wanted to stay with my Grandma for the night. Aisha played with the kids, most of them my cousins and some of them my nieces and nephews. She was tired and went to bed earlier than usual. In the morning, Aisha surprised me by having Paratha for breakfast. I have never seen her eat Paratha until now. She never liked it. When she saw the kids eating it, she fell in love with it. My aunties made fun of me when they saw Aisha eating the Paratha, after I have explained to them that she don't like it. 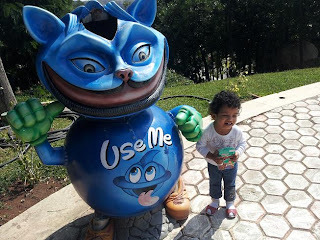 Aisha has become more friendly towards kids. 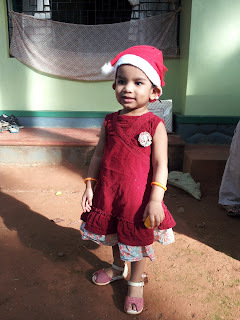 She is not afraid of people with whom I interact often, my cousin sisters and aunties. When she saw my FIL, her grandpa at the function, she immediately jumped to him. I was happy to see her gone with someone else and I came to chat with my relatives. And then I had a shock - something that I'll never forget my entire life. My FIL called me to ask me if Aisha is with me. I said no, and he said that Aisha is also not with him. It seems someone called him and when he was talking to the person, he asked my brother to look after Aisha. Aisha came inside, and since men are not allowed inside, my brother stayed outside. He thought Aisha has come to me, while actually Aisha was playing with one of the kids. I started looking for Aisha all around the place, in the garden and in the neighboring houses. The marriage event was spread in three of my uncles houses, and I ran to all three. I was scared to death - I looked up and down the road doubting if some one has kidnapped her, God forbid! I felt horror and sorrow finding its way up to my throat. I felt tired and weak, but couldn't rest. I don't know what all feelings passed through me during those couple of minutes when Aisha went missing. And then suddenly my SIL came to me holding Aisha, saying that she was playing! Alhamdulillah... Alhamadulillah a hundred thousand times... and more!! And at last the day came... and went. It was my brother's wedding yesterday. Aisha's dad came home on Saturday to attend the wedding. Aisha was a bit shy when she saw her dad, after a week. We went to my would-be sis-in-law's home on Saturday night to give her the wedding dress for the next day. 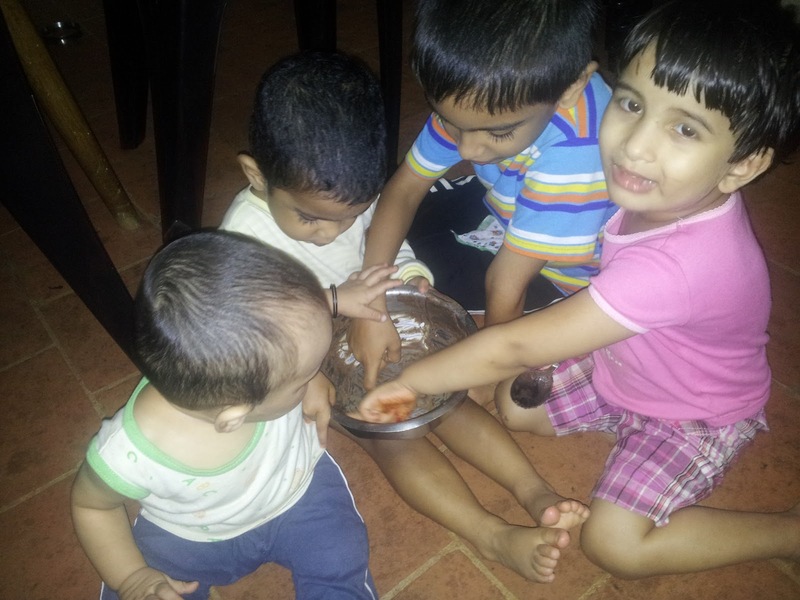 We returned home late and Aisha played with her cousins till midnight. I was really worried if Aisha would throw a tantrum tomorrow, with so many guests to irritate her. Although Aisha was shy and didn't socialize with the guests, she wasn't as fretful as I thought - I was anticipating an angry Aisha with lots of people around her. Once at the bride's place, Aisha was happy to see her grandpa, my father-in-law. 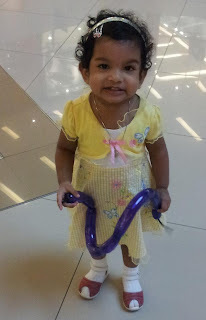 The balloons also made her happy and playful. She was running around the place with my nephew and niece. After Nikah and lunch, we returned home and I put Aisha to sleep. Aisha slept till evening, and by that time the guests have gone and only some close relatives stayed behind. Aisha soon got closer to her new Aunt, my new sis-in-law. Aisha and her cousins at the catering area of my brother's wedding. Aisha is two years and one month old, which means I've to start planning about stopping breast feeding her. I don't want to go for the cold turkey approach followed by most people in our community and so I had to think out and work on a new plan. I decided to break the task into sub tasks and complete one task each month. 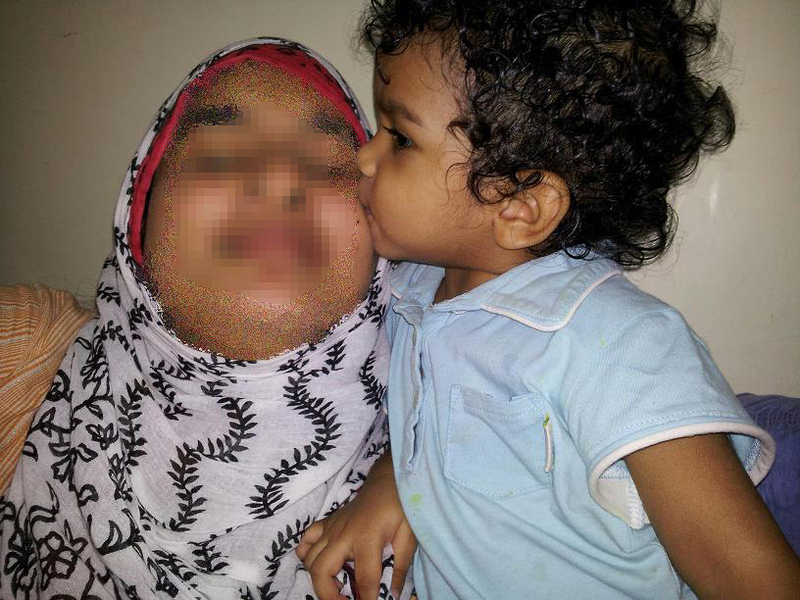 Actually I wanted to breastfeed Aisha until she was 2 and a half years old, like I said in one of my earlier posts. I took this decision when Aisha was born. People often advised me that nursing kids even after two years will make weaning difficult. Thanks for the advice, but I have my own reasons for keeping up with lactation for another six months. First, I think Mom's milk has got no substitute - so why deny your kid one of the best things she can ever get in her life? The second and my personal reason behind feeding Aisha for another six months is to protect my own health. I've lost a child during my first delivery, and I've suppressed lactation at the time. I've also thrown the expressed milk down the basin - a deed that takes all your senses away when you do it. It makes you feel sad, mad and very very bad. So something inside me asks me to give away the lost milk to Aisha - I know I look weird to all of you. Third reason is the scientific reason. 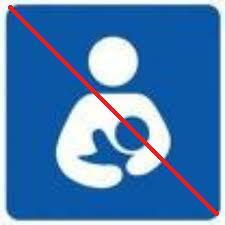 Breast feeding reduces breast cancer. Since I was not able to feed a child during my first delivery, I think I am more prone to breast cancer. So, may be feeding Aisha might help. The last and fourth reason, I want Aisha to feel the safety and security she gets while I nurse her for a longer time. 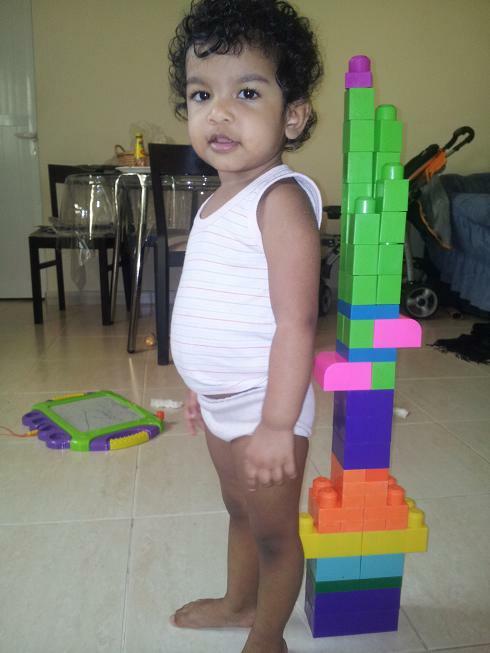 At least till she is two and half years old. 1. During the first month, I'll stop feeding her while we are out of our home. 2. The next step is to feed her while putting her to sleep, during her sleep time and when she hurts herself. Nursing is a pin reliever for kids. 3. Feed her only while putting her to sleep and during her sleep. 4. Feed her during sleep only. (I think this will be riskier as she won't go to sleep without nursing). 5. Stop feeding her completely. The flight back home was at 12 noon. D came home yesterday to bid us goodbye, we hired a taxi to take us to the airport. 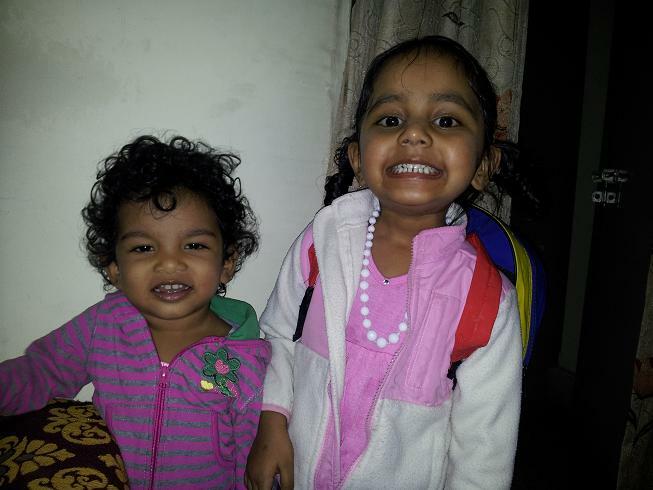 It was a wonderful stay at Hyderabad and many thanks goes to S and D for making us feel at home. The gazal song in the taxi brought a nostalgic feeling, although it was only five days since I have met Hyderabad. The airport had a good book shop in their lounge and I spent some minutes there. We met some Malayalees from many places on our trip, at the museum, the Film City and now at the airport - there were many. Its good to see people who talk you mother tongue. Aisha slept during the first phase of the journey. She woke up for lunch. I think we were flying above the Western Ghats, when my ears started paining. It was terrible, and this was the first time for me. Hubby had his share of the pain during our trip from Dubai to Hyderabad and so he was fine now. Aisha also started yelling with pain. The main cause of the problem was our blocked nose. We suffered the pain for almost half an hour, and Aisha was so agonized that she wanted to cling to my chest. Hubby couldn’t do anything to make her come to him. It was a terrible time with pain in my ear and a yelling Aisha on my chest. I was so relieved when at last the flight landed, and we got out of the airport quickly. Father-in-law was waiting for us. Aisha still remembered him even though she did not allow him to hold her or carry her. We reached home by 4 pm. Aisha was running through the place, touring the place. She went for the hen coop, upstairs and ran through the rooms. Aisha’s great grandmother was also there at home, although she is an Alzheimer’s patient and remembers nothing. Home at last and we were urgently in need of some rest and sleep. Since the riots forced us to stay out of long journeys, we decided to discover our neighborhood and other nearby places. After yesterdays late night sleep, we woke up late and it was noon when we got ready for the expedition. 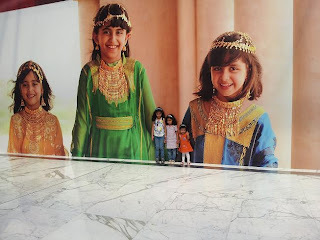 So we went for shopping at MPM mall and Ashoka Metropolitan Mall. I bought some dress materials and a bag from MPM mall, while hubby ordered for some shirts and a pant at Ashoka mall. We walked through the malls and the streets. Crackers were still heard at a distance and we were shocked when a cracker exploded near us. Aisha was terrified, but she didn’t cry. Brave girl! That was the last night at Hyderabad. Friday meant Jumua prayer. So we decided not to plan any tour activities today since it would be difficult to take part in the prayer. 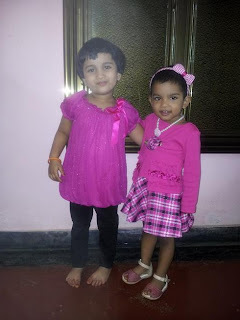 We decided to meet my friend, Nishana, who lived in hyderabad. We have been roommates during our collage life, and going away without meeting her was out of question. Actually I wanted to spend a couple of days with her, but the tight schedule of our program made that impossible. 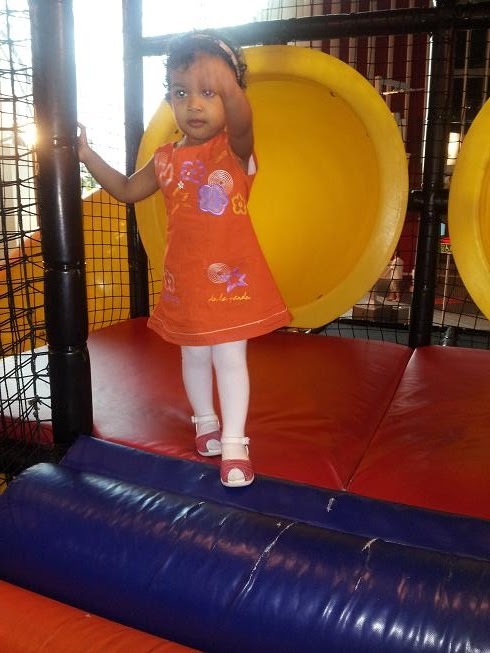 We were invited for lunch which made it easier for hubby to go for Jumua prayer with her hubby, J. Nishana’s 3 year old daughter Liya was also waiting to see us Aisha. 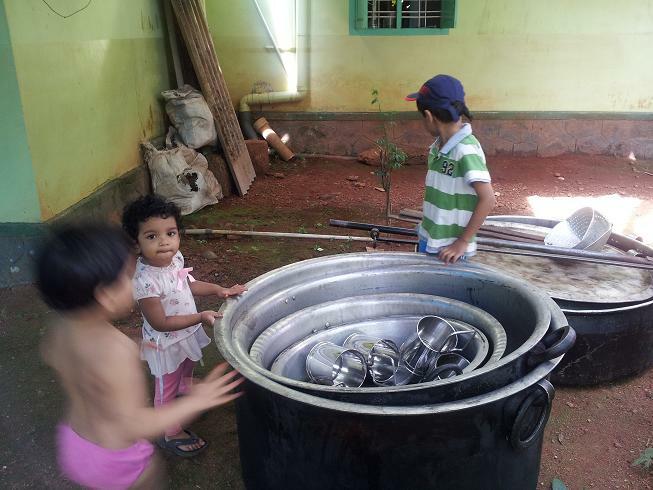 It took a lot of time for the kids to get friendly with one another, as initially they were fighting for the toys. But later, they became good friends and walked hand-in-hand (and yes, this time there were no toys to fight over. The new discovery- the toys spoils the relationship!). Nishana treated us with the special dish of hyderabad, a Hyderabadi Biriyani. It was a splendid lunch and I loved the beef roast she prepared. We don’t get good beef in Dubai and it was after a long time we tasted beef. Nishana and her family dropped us at S’s home. We planned for a city tour for the next day and booked our tickets. 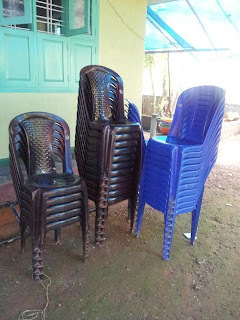 But once at S’s home, someone called to tell us there was a minor issue at some place of Hyderabad – a communal riot. How these riots spoil everything! Hubby was afraid to go for the city tour, and he had good reasons for that. First, we don’t know Hindi, Urdu or Telugu (the languages spoken in the place) and second we don’t know the place. So we dropped the plan for the next day and went for shopping with S.
Later that night, after dinner and Aisha sleeping, we sat for another chat. S was the follower of Hinduism and we had long and meaningful discussions on various topics, including religion. S practiced yoga and he gave an informative talk on yoga. We also discussed on how politicians and unfaithful religious leaders have used religion to allure the public and bring communal riots. It was 2 am when we went to sleep! We spent the whole day at Ramoji Film City. Although the starting time was 8:30 am, the bus arranged by the AndraPradesh tourism reached the departure point only at 10 am. The bus journey was a good one, going through the hearts of the city and finally getting into greener areas as we reached the Film City. 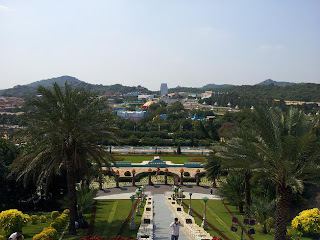 The Film City is situated out of the hustles and bustles of the city. We were informed that the bus back to our starting point would depart at 4 pm. It was a wonderful place. 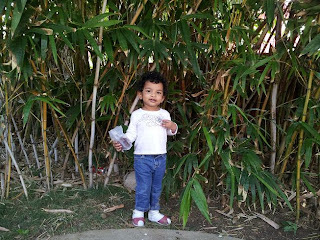 I thing Aisha loved the outdoor excursion that day. She was happy and excited. Although there was a small play area for the kids, we didn’t have time to spend there. Aisha was a little agitated about that. There were special coaches that took us to the different studios inside the City. Once inside the coach, Aisha forgot about her play area and once again came to her happy mood. We toured the whole place as fast as we could, since time was something we didn't have much. Aisha loved the butterfly garden, with thousands of them fluttering by her. We walked around the place till lunchtime, and after lunch we went in for the different shows and other indoor activities. Aisha soon slept and woke up only when we reached home. D was doing an MS program, and so she left us early in the morning after making us a hearty breakfast. Even though she was busy and had a long day before her, she was very particular in making us feel at home. 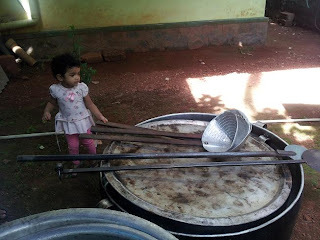 S was helping her but she never wanted me to do any of the chores – even wash the plates. I was still tired after the late night sleep and so everything wasn’t going well as planned. By the time we bathed and got ready, it was time for lunch. 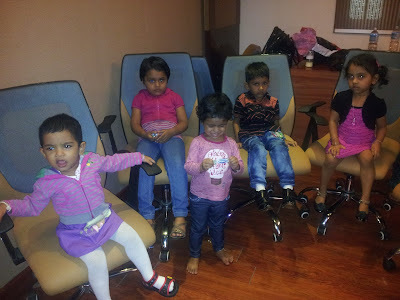 We dined out and went to the Salar Jung Museum of Hyderabad. There are many excellent works of art in the museum, including the double-faced statue, the veiled Rebecca and the musical clock. There are also many paintings that depicts the Indian culture during the ancient and medieval times, under the Hindu, Muslim and British rulers. The museum has all under one roof - paintings and sculptures from Hindu mythology, the works of Muslim architects and the artifacts from the Greek and other European mythologies. Sometimes you wonder at the different styles of life and beliefs the country has gone through. We reached the museum at around 3 pm and the closing time was 5 pm. We had to rush through the halls. 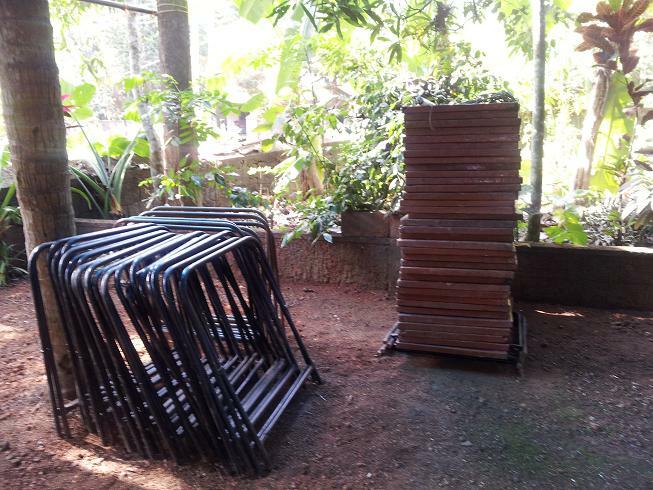 Since some repairs and constructions were being made at the museum, we were not allowed at some galleries. As usual, Aisha got tired and frenzy and started being peevish. Aisha started yelling when I put her bag on the scanner at the entrance of the gallery. Literally, we ran out of the museum. It was when we got out of the museum that we remembered our camera was with the staff of the museum – shooting was not allowed inside. Hubby went again to get it back. Touring with youngsters is not at all a good idea. 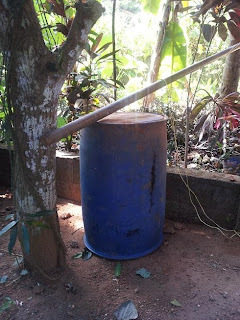 We have been planning to settle in India for a long time, and it was time to decide. 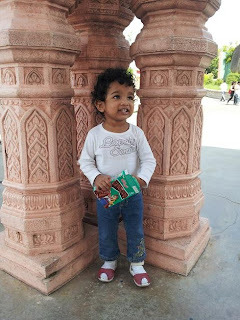 I loved India; because I think that’s the best place for Aisha- she can grow up being a better human. At least, that’s one of my beliefs. So I decided to go come back to our home country. We also planned a short tour on our way home. Hyderabad is a place where you can steal into the medieval times of India and emerge into the modern days simultaneously. You can see the temples of Hindus and the Durgas (mind it – not masjids) of Muslims at every nook and corner of the state. The place is known for its rich history and varied culture with lots of monuments, museums, palaces, parks and other architectures. To walk through every pages of the Hyderbabad history book, you will need almost a month. And now you have also got the modern Hyderabad too, where you can see a combination of north and south Indian cultures along with what you call the ‘modern’ or ‘western’ culture. 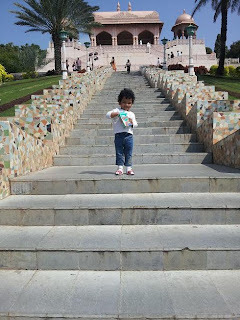 We knew that we wouldn’t be able to tour the entire Hyderabad within the five days of our stay. But we wanted to make the best efforts. We started from Dubai on November 13th. 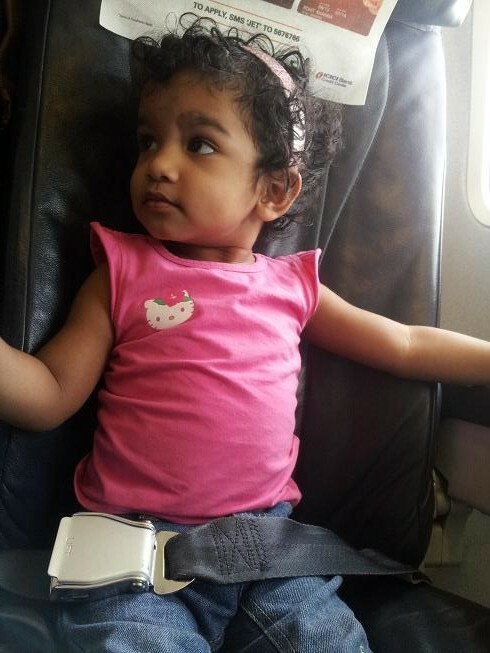 Aisha was officially a child now, and so had her own seat on the flight. She quickly learned how to close and open a seat belt and was practicing it until she finally slept. It was Diwali season in India. Diwali is a festival celebrated by the Hindus. There are many stories behind the occasion including the one in which it says that diwali is celebrated to welcome the Lord Rama when he came home after 14 years of excile. The people of Ayodhya celebrated the return of their lord by lighting candles. In short, Diwali celebrated to denote the victory of good over evil. We reached Hyderabad at 9 pm, to the thundering sounds of firecrackers, the blinking LED lights and the beautiful Diyas (ghee lamps). 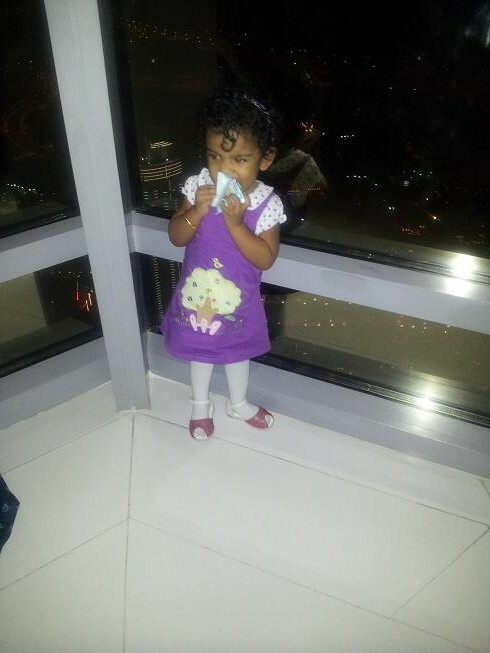 Aisha, although tired and sleepy, was delighted to see the crackers far in the sky. Hubby’s friend S and his wife D were going to be our host for the five days. We arranged a cab to drop us at their house and they were waiting for us. Aisha was excited to see a huge fountain-cracker just in front of her when we stepped out of the car. S also has decorated their beautifully home with Diyas and flower garlands. Although tired, Hubby was seeing his friend after a long time, and so we chatted for a long time after dinner. Aisha was asleep. D and I sat down to hear my hubby and S reminiscing about old times. It was hubby's and his twin brother's birthday yesterday. Oh! I forgot about that. We have planned for a visit to the Ferrari themed amusement park situated on Yas Island in Abu Dhabi. Hubby's friend was joining us on the trip and it was he who reminded us of the birthday. The three at the entrance. Ferrari World, like other tourist attractions across UAE has also got some world records. I think its the biggest indoor amusement park. Unfortunately, the roller coaster was out of service on the day we visited. We had no option but to get contended with the other rides. Most of the rides were for bigger kids, and not toddlers. Aisha was permitted only to 3 or 4 rides. We took turns in rides so that Aisha was not left alone. Aisha loved the slides more that the rides. Unlike most other kids at the park, Aisha wasn't afraid of the climbing nets or the tubular slides. She always opted the climbing nets instead of the stairs. 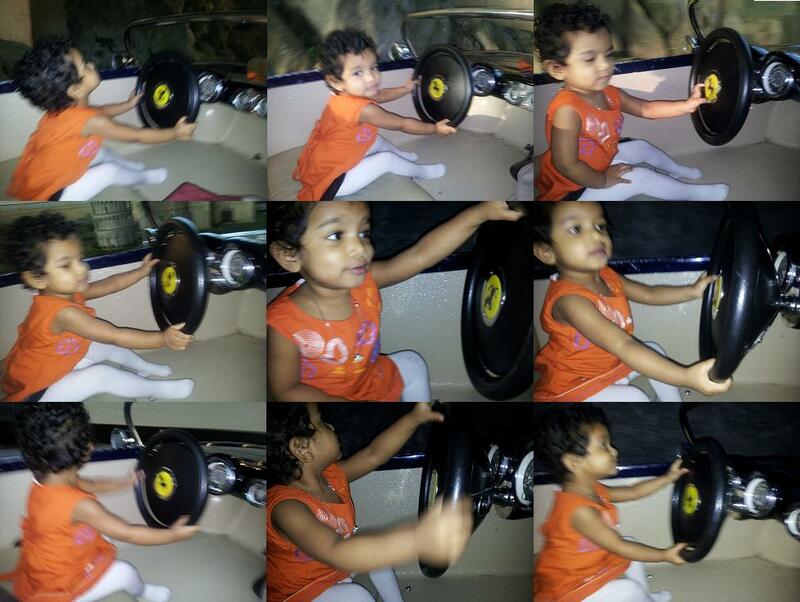 After the drive in the car, Aisha wanted to drive her dad's car too!! We left the place at around 8 pm. Aisha was tired after the eventful day and she was fast asleep as soon as we got into the car and started back home. 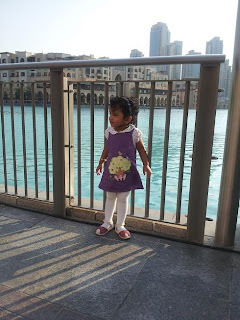 Yesterday, we- Aisha, me, my co-sis and my niece-in-law, visited the Burj Khalifa, the tallest building in the world. We booked our tickets earlier and so the appointed time for us was at 4:30 yesterday. As it was still working hour for hubby and his brother, they were not able to accompany us. 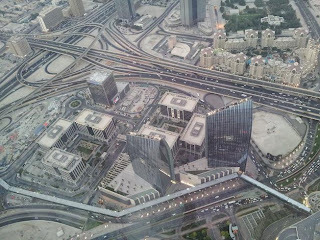 We took the metro to Dubai all and from there they provide special entrance to the observation deck situated at the 124th floor (above 450 meters) of the building. We reached the place before our time and so we decided to take a walk through the parks and ponds. We were permitted inside only at the specified time. After security check, we were asked to wait in a queue. We waited in four or five different queues before we finally reached the lift that took us to the observation deck. Aisha slept from one of the queues. It took less that one minute to reach the floor. I felt my ears popping. It was good that Aisha slept, or else she would have yelled at top of her lungs! The sight from the deck was like the scene you see from your flight-window during landing and take-off. We decided to stay at the top until sunset. It was breathtaking to see the sun slide into the sea and the land below start glowing in the yellow street lights. A more glorious sight was the Dubai Fountain from above it - the water, light and music brings a marvelous movie below you. Aisha woke up a few minutes later to see herself at the top of the world. Aisha was hungry and although food wasn't aloud at the place, I had to dig her out some snacks that was kept unnoticed in my bag. The returning queue was also a long one which made Aisha even more fretful. With Aisha in a bad mood and the 2 plus hours of stay on the deck holding Aisha, I was more than happy to get out of the place. 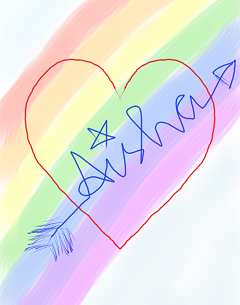 This was the birthday gift to Aisha. We have decided to move back to India and so I wanted to take her to the zoo in UAE. I have been planning for this for long and got the chance only yesterday. The truth is, we never really heard of any zoos near us, or we never bothered to learn about it. I came to know about this zoo only a week ago. And it was only one-hour drive to the spot. So, we planed the trip on Saturday. We started after lunch, the time Aisha usually sleeps. She slept through the whole journey and woke up only when we got out of our car near the zoo. 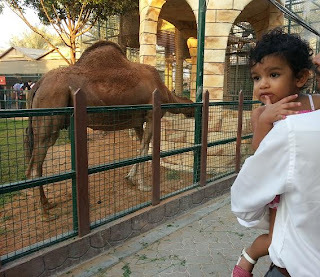 As soon as she saw the horses and camels outside the zoo, she got excited and started shouting. Inside the zoo, it was parrots that greeted us, echoing our cries to them. Aisha was thrilled when she heard the parrot scream her ‘hello’ back to her. But she was afraid if they will bite her, and never allowed us to go near them. It took a long time for her to get fearless of the animals inside the cage. Whenever her Dad or I went near a cage to get some snaps, she shouted saying the animal will bite us. After about half an hour, she finally understood the animals are harmless and then started walking by herself. There were almost every animals found in Arabian peninsula. 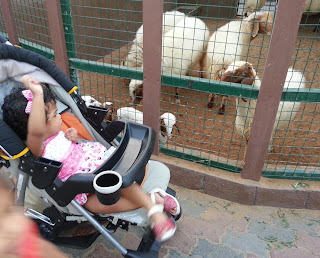 We saw a variety of monkeys, camels, goats, sheeps, ostriches, pigeons, and hens, making me wonder why do the same species have a number of different varieties in them. And yeah, why do we have the Asian, Mongolian, African, European etc amongst us? There were wild animals like giraffes, zebras, kangaroos, variety of deers, lions, tigers, cheetahs and many other animals from the royal cat-family. I loved the big fat tiger so much. 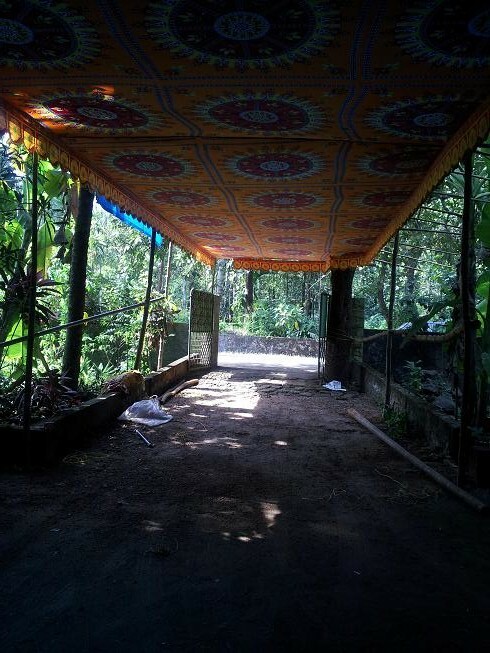 I kept Aisha’s pram near the window of the tiger-cage for her to see the majestic creature, but I saw her crouch in fright when a tiger came towards the window. Next was the foxes, wolfs, hyenas and some others hunters. The birds’ section also had a large number of species in them, including peacocks, of which I knew only a few. The best part was that we could feed the animals. Although Aisha was afraid to feed them, she enjoyed seeing them eat the leaves and pop-corns I offered them. I don’t know why the giraffe ran away when I touched it. There were some rare animals too, some of which I don’t know the name (I couldn’t read the 20 to 50 lettered names of them written on the information cards) and some of which I forgot the names. Aisha was more interested in the slides, seesaws and swings inside the cafe than the animals inside the cages. Among the fishes Aisha recognized Nemo, the clown fish, and two of his friends from the aquarium. And then there was the snake-section which Aisha didn’t like as the snakes were all ‘sleeping’. She loved the python, as it was the only snake that moved inside the cage. From the reptile’s sections, we played the hide-and-seek game. Aisha enjoyed finding the hidden animals. Most of the reptiles had their skin color that looked similar to their surroundings and so it was difficult to spot them quickly. The zoo wasn’t a big one and so we completed it in two hours. Once we got into the car, I asked Aisha what she had seen and she replied, “Tiger…horse…hen…monkeys and fish.” Good. I remember only a few of the rare animals. Technically, she grew up from the infant-hood to the childhood. I have got no words to describe my happiness. This blog will tell you how Aisha has changed during the past two years. As usual, I don’t know if I should be happy or sad. May be I should be both happy and sad. 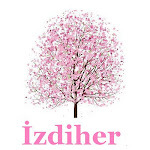 One thing I’m sure about is – I should be grateful to Allah…so much grateful to Allah for giving me two years with Aisha. This was the happiest days of my life. Thankyou Allah for this huge blessing… Alhamdulillah. 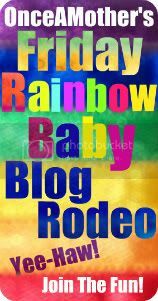 Now coming into the blogging reality let me take a peek into the commitment I have made. The bucket List. Some of the events are yet to be stricken off. I plan to make these events happen before her third birthday. So, we will be putting up a new bucket list that includes the unstricken assignments of the old list and some new tasks too. That’s the way to enjoy the roller-coaster ride with Aisha. You can go to the page Things To Do Before Three for the list. Aisha turns two tomorrow. Alhamdulillah... I never thought all this will be happening. I'm so happy. Alhamdulillah. I don't think I can ever thank Allah for this greatest blessing in my life. Alhamdulillah again... and again. Two years back... I was nervously waiting for the day. Monday. Rainyday. C-section. One month hospital stay. Coiled umbilical chord. Lots to think. Today... 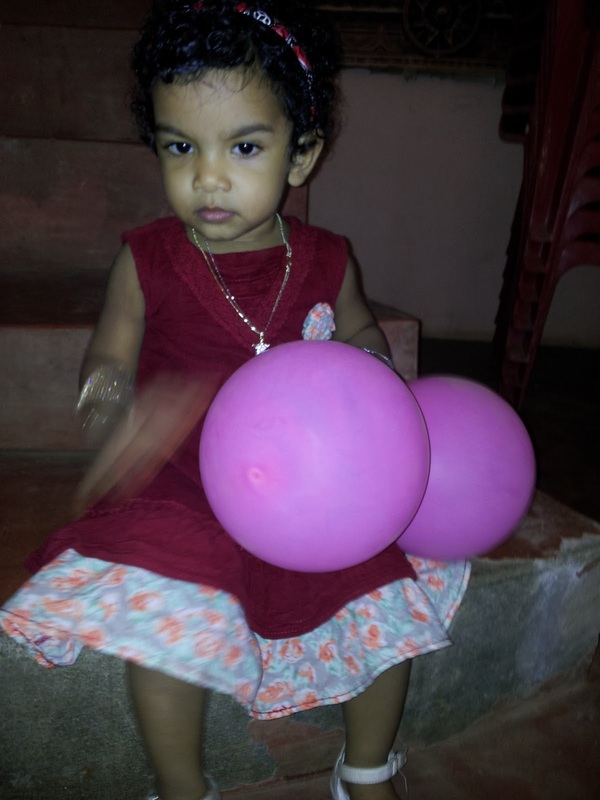 Excited as Aisha turns two. My life's changed a lot. I got busier. I love the bsuy days and tired nights. I love the kisses I get from her. I love it when she asks me if I need help from her, lol!! I love everything of her. Her smell...her sound... her naughtiness... everything. Thankyou Allah for your blessings. I'm not sad because You took away my son... You blessed me with a daughter. A daughter like Aisha. My niece-in-law, Z, came to me with her kid's magazine and asked me tell the story of the pictures in it. I took the book from her and explained the story to her. It was about a cow and calf, I don't remember the whole story now. Aisha was also with us, listening to the story. I though she understood nothing. Next day, when Z had gone to school, Aisha picked up the magazine and came to me. She turned the pages until she saw the cow, and then said, "Mom, story!" I thought she was just imitating Z and believed that she would never understand a story. So I took no notice of her. After sometime, when she understood that I am too busy to listen to her, she started saying the story herself. "Mom cow... baby cow. Baby cow... look... water. See... in water... baby cow. Baby cow... frightened..." and so on. I was surprised. I felt guilty for underestimating her. Once again she taught me not to belittle anyone. And she showed me she is growing fast, faster than I imagined. 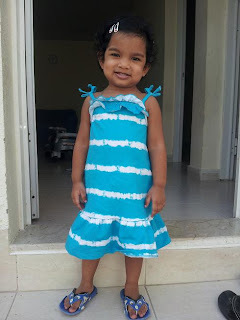 Aisha, my sweet little pie, has also started saying 'Alhamdulillah' when she sneezes. Although not always. 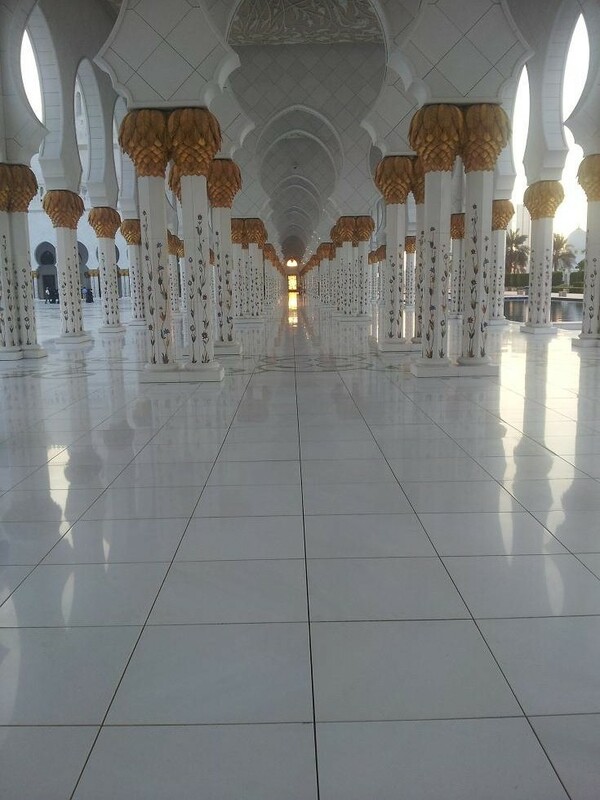 May be Shaikh Zayed Mosque is the first of its kind - a mosque for tourism. Situated in Abu Dhabi, UAE, it has got many first places in the record book. The main attraction of the mosque is its fusion design, which includes the Indian, African, Western and Arabian designs. If you are in search of a place where you can pray in peace and be near to Allah, you are in the wrong place if you are at SZ mosque. At SZ mosque, you can wonder at the huge chandeliers hanging from the roof, watch the beautiful designs on the walls and pillars and walk on the biggest hand woven carpet in the world. The truth is, you will not know all these until you reach there. That was the case with me too. Everyone who have visited the place before told me it was like visiting a museum. I didn't believe it. A mosque has got to be a mosque. So we decided to go. It was a two hour journey through which Aisha slept, as usual. Finding the parking lot was a bit difficult as they are constantly redesigning the area and the navigators couldn't do anything to help us. So helping ourselves with what little knowledge we have got on directions and positions, we at last found a way to the parking place. I don't think shopping malls have better parking lots!! Contrary to the dress code in other places in the country, modest clothing is mandatory inside the mosque. For those in sleeveless and short dresses, the officials provide abhayas and thawbs. It was amusing to see people taking pictures of themselves in arabic style dresses. Aisha was busy running through the big halls, long corridors and spacious gardens. She wanted to swim in the pool, but that was not permitted. She loved the ablution area very much. The main hall of the mosque opens for prayer only during Jumua (Friday) and Eid prayers. 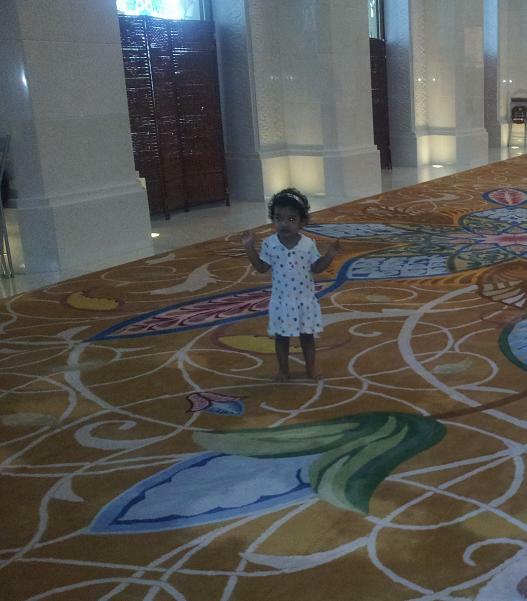 The rest of the prayers are conducted in smaller halls to each side of the big hall. 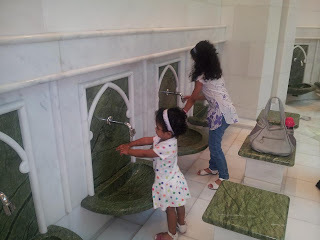 We went in search of prayer halls after ablution. It was a long way. We prayed Asar and Magrib from the mosque. Aisha joined us in Asr prayer, but during Magrib, she was hungry and thus querulous. The designs on the wall and the floor, the inscription of Allah's 99 names on the wall facing the Qibla, the carpet, the chandeliers and the blend of Mughal architecture in the design are splendid which makes you feel like you are walking in a medieval palace in India. Playing with blocks means building Burj Khaleefa. 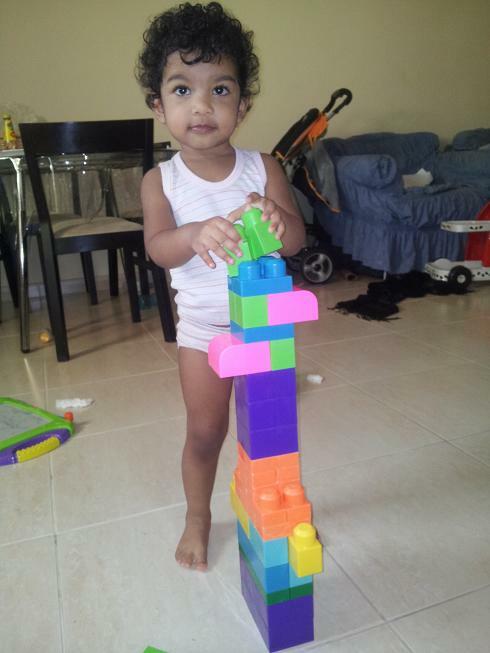 Aisha knows what Khaleefa tower is, but of course she doesn't know its the tallest building on earth - at present. I don't know when she will come to know it, or when she will understand the concept of longest, fastest, tallest etc. 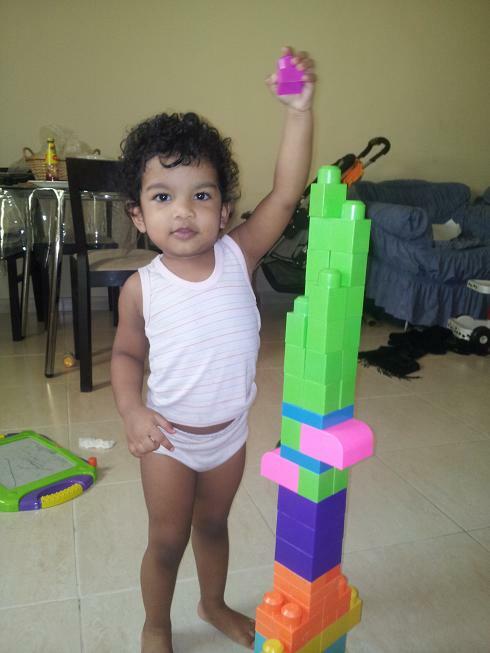 At present, anything big is Burj(= tower) Khaleefa. 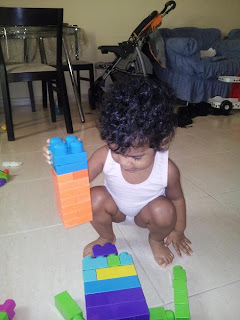 Coming back to the building blocks, Aisha empties the packet on to the floor and demands, "Mom, Burj Faleefa." 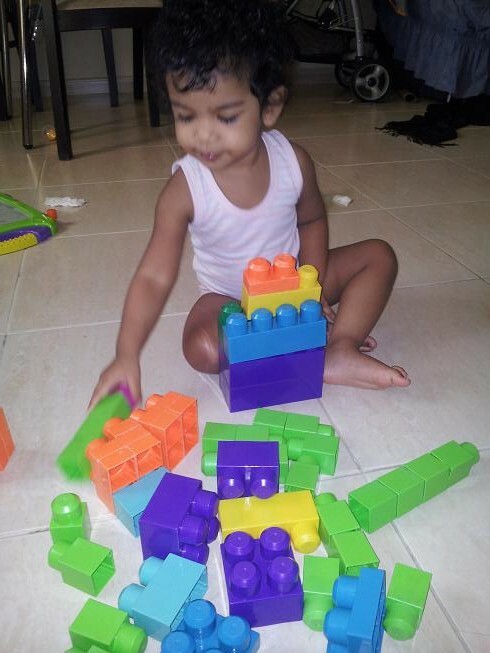 She pronounces the 'Kha' as 'Fa', although she uses the 'Ka' sound in many other words. I attach the blocks on top of the other, building a strong base and then the tower. She is happy to see it, but kicks at the bottom of the structure as soon as I finish. She learned the habit for my nephew who loves to 'destroy' anything he makes. I love to keep the building as it is but Aisha likes to break it and rebuild it again. 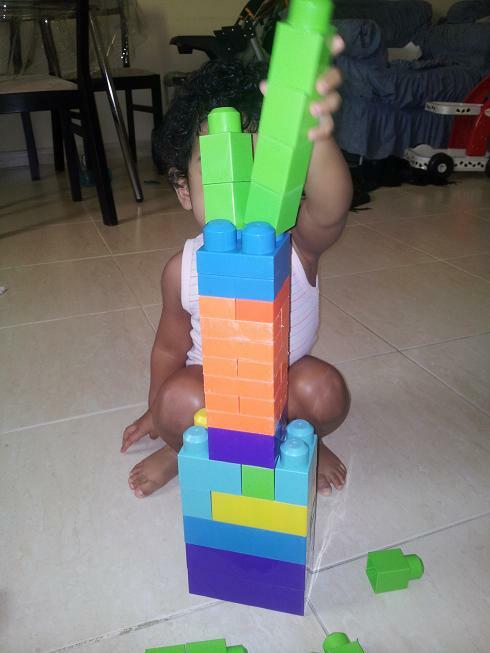 Aisha made her 'burj khaleefa' yesterday, with a little help from my side. After the confinement during the long days of summer, we decided to go for a change with a long drive to a hilly place called Hatta. It is near to Oman and a part of Dubai. An oasis surrounded by the hills. As usual Aisha was happy to know that she is going out, and that too early in the morning. I don’t know how this happens but when I want her to get the maximum sleep on an eventful and long day, she seems to wake up earlier than usual. This day too, she was up by the time I finished my bath. I washed her, fed her and dressed her. The moment she is dressed, she wants to get out of the house. She starts yelling and by the time we are ready, she will be in a mess. Today was no exception for her drama. Our relatives joined in and we were four families with three kids – Aisha’s cousin Zahra and Z’s cousin Ihsaan. Aisha, Z and I were together in one car. Aisha was thrilled to see I, who is only 5 months old and she was always pointing him and shouting, “Look mom, I is doing that” or “I is doing this”. 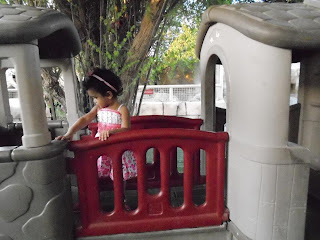 Our first destination was a park at Hatta, were the kids could stretch out and play on the slides and swings. They ran everywhere, happy to be out of the car. After Jumuah prayers, we went in search of a decent place to lunch. We were disappointed as there were no good restaurants, and after ½ an hour we finally selected the ‘best’ place available, although it was below the standards. The food was also bad. Hatta is a very small town; you can never call it a town. There are only a few people living there – the UAE nationals who are probably the government staff of the place and some East Asian expatriates who work in groceries, laundries, garages etc build for these nationals and themselves. I don’t think there are more than fifty shops in that area. 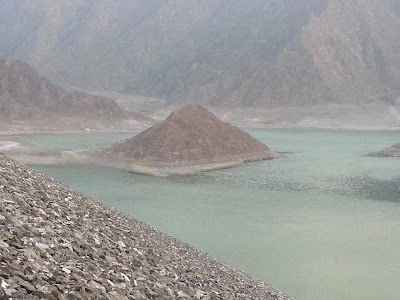 But Hatta is a place of tourist attraction. Our next stop was at the heritage village – a place form where you can read the history of UAE. It was a fort and inside it there were tents, utensils and weapons used by the old Arabs. Aisha wasn’t very happy to explore the place, as she was a bit tired and sleepy. The only entertainment she found there was a cat, which came near us. We went to a mosque for our prayers, from were I washed Aisha and changed her dress. 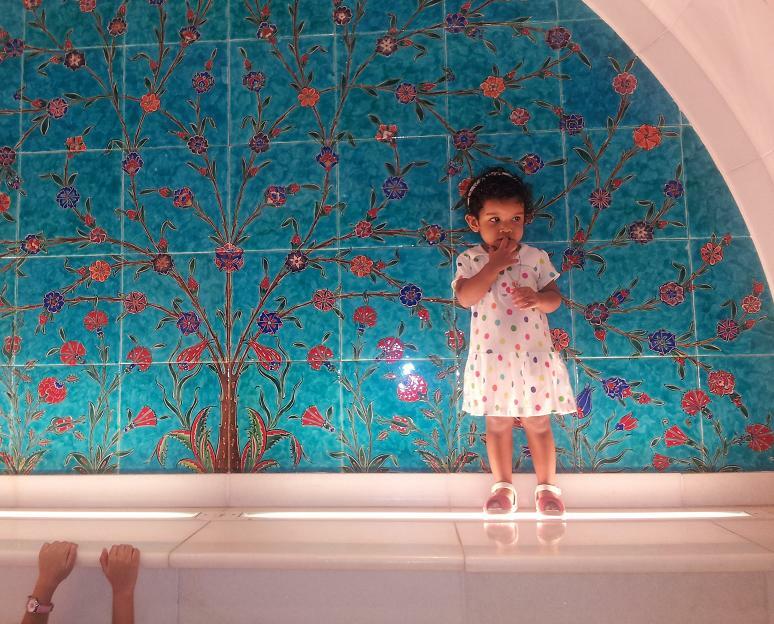 The refreshment made her active and she was lively once more, running across the masjid. 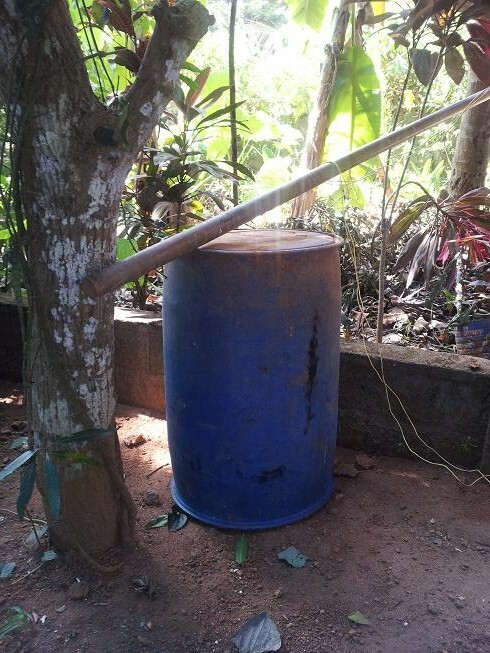 I was also refreshed, with the cold water on my face and a little rest under the a/c. 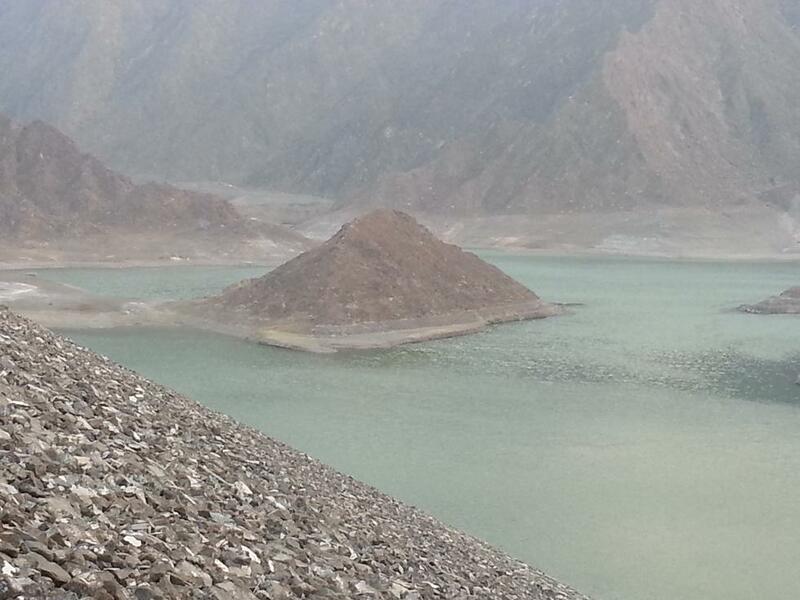 With renewed energy, we started for the dam – the main attraction of Hatta. The dam was beautiful, surrounded by the hills. But it had only little water in it and it looked like a big pond to me compared to the dams I’ve seen in India. We had to climb down a lot to reach near the water, but the water level meters indicated a full dam once it started to rain. 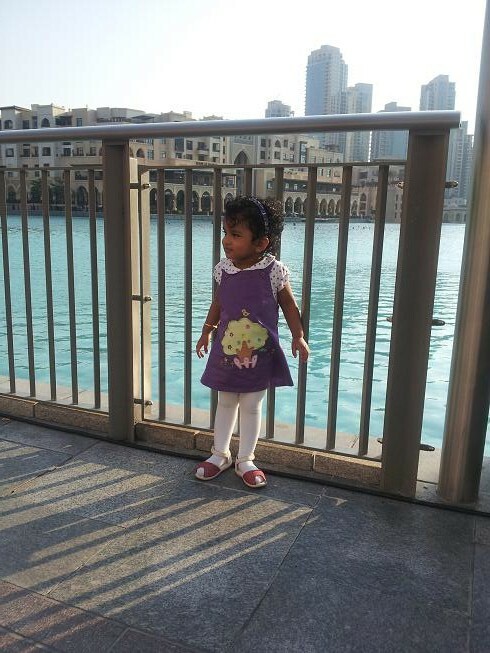 Aisha wanted to play in the water but her dad did not allow her. She was a little fussy about it. So I took of her shoes and allowed her to step into the water for a few minutes. She was reluctant to return, but had no choice. It was 6:30 in the evening and we had to reach Dubai. She slept as soon as we got into the car and woke up only when we stopped at her aunt’s home in Dubai.